I suppose I’d never have got to see Nadal play if I hadn’t been doing the hoovering in my underwear. It is probably the only time that housework resulted in something thrilling in my whole life, but, there I was, one drowsy afternoon in the dog days of June doing battle with the dustballs under the sofa. I had some random afternoon telly bleating in the background and a cup of tea on the go, cursing at the stupid unhelpness of “Henry” the hoover. The telly droned on in that depressingly mediocre way mid-afternoon telly does and I am surprised I actually heard “You can win 2 Centre Court tickets to Wimbledon by entering into this quiz!” because I was busy hitting the hoover whilst shouting at it. “All you have to do is enter this quiz!” some buck-toothed, third rate sofa presenter gawped. “It’s multiple choice,” she announced soberly, as if telling us we were all going to sit an A Level Latin paper. “Now, has Tim Henman won Wimbledon a) 6 times. b) never, or c) 26 times.” Then a premium mobile number popped up in pastel colours on the screen featuring eye-watering call prices. I couldn’t believe my ears – 26 times?! Can people in this country be so stupid? (On second thoughts, don’t answer that). Can there be anyone who actually believes that Tim Henman has been winning Wimbledon every year since he was five? Perhaps it was my indignance at proving I wasn’t one of the stupid people, but I actually entered the competition by text. I never enter competitions by text, but tennis is one of the five things I know about – the others being cheese sandwiches, eyeliner, musicals and nail polish. “The answer is B – Never.” I texted back. Well, I can only imagine that no one else entered the competition or something, because about twenty seconds later I got a telephone call from an effusive-sounding production assistant called Katie who told me I’d won two seats for Centre Court for the second week of Wimbledon. “Well done! Congratulations,” she said, clearly over-excited. “They are Debenture seats!” she said, further increasing my mood of general confusion, because I had no idea what that meant. Anyway, I was delighted, and kept saying “Really? Really? IS THIS A JOKE?” and when I realised that it was not I thought it called for me to go and put some clothes on. The tickets were for Thursday week, which meant I had to call round all my tennis enthusiast friends to see who could book a day off work and sally forth to SW19. Eventually, My Very Good Friend the Doctor rallied and shoved a locum in to her NHS practice for the day so she could join me. The tickets were posted to my office, still with this “Debenture” bit on it, which I hadn’t quite worked out, but it sounded like benches. Yes, I would be made to sit on a bench. Probably next to Greg Rusedski and his rapidly disappearing hairline. Yes, I thought, that was it. On the day I was lucky – it was blissful sunshine. This was before the days of the slow-closing roof on Centre Court, so the weather was a massive plus. I wasn’t entirely sure what to do re food, so packed a bag full of bagels and cream cheese and set off with my panama on the Silverlink from West Hampstead. 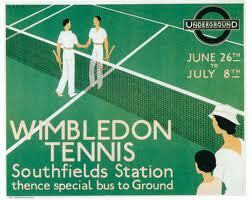 Wimbledon ought not to have a London postcode. I really think something ought to be done about it. SW20 is Surrey, and on getting off the final stop of the overground train, you are submerged into a piece of unLondon-like little England. Around me there is the closest thing the middle-classes can get to a thuggish crowd. They push at the barriers, John Lewis hangbags akimbo, thrusting forward in Wallis and Jaeger to get the best seats on the All England Club Bus, Marks & Spencers wicker hampers bashing aggressively against boarding school shins that have been rendered brutal by hockey. It was a glut of Hyacinth Bouquets, a mesh of the kind of English gentlewomen who, with their matronly bustles and their tidy home counties hair dos, puts the fear of God into every Englishman. I pushed until I arrived at the queue for the All England Club bus, which arrives every 20 minutes, dropping off all and sundry for the tennis. The coupons you buy for £1.50 have to be kept for your return journey. The bus smells of room freshener with an undertone of Pimms. It’s open top and now everyone has got their seats they are in a friendly mood. Disgustingly, as the bus pulls away from the kerb and journeys through Wimbledon’s pretty, twee streets, Cliff Richard music starts piping through the speakers. The All England Club is vast – 19 tournament grass courts and a host of car parks around the edges. Once within the grounds, I am lost. I eventually locate My Very Good Friend the Doctor, both of us surprised that our tickets said 11.30am. Why, when play hardly gets going before 12.45pm? Our tickets and the competition that funded them were a gift from Robinsons, so I can only imagine we will be forced to drink Lemon Barley Water for the next 75 minutes. It is all I have ever dreamed of. However, we follow the directions to a building where we have been asked to meet the other competition winners. In the blazing heat we cross over what seems like two enormous Surrey fields, before arriving at a clubhouse of sorts, where the oak-panelled hall is lined with impressive medals and shiny things and pictures of award winning tennis players doing marvellous things with their little balls (The observing eye will notice no black players appearing before 1951, because Wimbledon wouldn’t let them play there until then. Jews were allowed to play after 1952. It isn’t all croquet, you know. Sometimes it’s just good old fashioned racism to go with your strawberries and cream). We follow the signs and go up perspex stairs into what looks like a really smart gastropub with delusions of grandeur. I turn to face the other competition winners. They have the faces of death. They are a motley crue – a man dressed in a brass-buttoned navy jacket with yellow teeth, a woman chewing gum loudly with a hat three sizes too big for her, and a really dour looking couple, the wife with a dark brown, fierce bob and a husband who looks like he’s never been laid properly in his life. The first too are smiling in a deranged, friendly sort of way. The latter two are scowling. “Hello!” we say. It is at this point I realise what Debenture means. Debenture means being forced to eat a four course lunch at 11.30 in the morning. Debenture then haul you back for a full cream tea at 4.30pm. Debenture means sitting at a large table with as much alcohol you can drink with professional competition winners. Debenture was the worst hour and a half of my life. The woman with the Big Hat announces she has just won £10,000 in a competition, having entered 250 competitions a week. She is now giving up her day job to “focus on winning competitions full time”. It is only now I notice her lazy eye. Her voice is shrill, like a telephone that has got something wrong with it’s mechanics. From the starter (excellent smoked salmon) to the dessert (strawberries and cream, what else?) her husband lists off everything they have ever won in a riotous history of freeloading. They got Waitrose free shopping for a year, they won a car, they had a day’s “golfing in Scotland”, refusing to be hampered by the fact that neither of them had ever played, or ever wanted to play, golf, they got free home insurance, they won £100 in Argos vouchers, they entered a competition with Sainsbury’s and won a crate of wine. They do this by spending their entire day going through email offers, postal offers, and logging into competition sites. As soon as they realised that we were not full-time, insane competition junkies with equally soul-less money obsessions they had nothing to say to us. After they had eaten their lunch in a way that suggested they would never eat again, and the scowling lady with the bobbed hair had shoved the bread rolls into her handbag and walked out with a bottle of champagne, we headed to Centre Court. Our seats were half way back but the view – and the tennis – was glorious. The dark green colouring of the top half of Centre Court makes you feel like you are in a vast, underwater cavern, delightfully cool on this hot day. I saw Julien Benneteau in the first hour, Amelie Mauresmo was next up (I forget against who), and the atmostphere was blinding, although the play got off to a dodgy start. No sooner had we sat down and a linesman passed out and was neatly lying face down on the court. Someone asked if there was a doctor in the house. “You go – you!” I nudged My Very Good Friend the Doctor. “You’ll get to go back there and grab Nadal’s balls, or whatever it is you want to do.” But eventually the linesman stood up of his own accord, so Nadal remained sexually unmolested. For my friend is one of those people who find Nadal sexually captivating. I do not. Any man who fiddles with his bottom that much is not going to be attractive to me, but as Nadal arrived on court, at 3pm on a muggy, warm, airless day, the whole court seemed to sense something thrilling was going on. “Nadal…” she kept whispering, as if trying to summon him, as he vaulted a couple of dynamic practice shots in the general direction of the Duke of Kent. “NADAL….” she said again, as he tucked his hair behind his ears and shoved his bottom out on the base line. “He shaves his legs,” was all I could say. “Shut up,” she said. This was back in 2006, when Nadal still had a pair of fully working knees. This was the first year that the buzz of Nadal really seemed to reach fever pitch. By this year, Federer and Nadal were truly the only male players to be watching. He played the most brilliantly that day,in his strange shorts that reached the (shaved) knee, beating Kendrick, a day only punctuated by the repetitive thwack of tennis ball against net, of polite clapping, of the occasional sound of ice tinkling in glasses as a player was about to serve. It was heaven. I never saw the brutal looking woman with the bobbed hair or her husband. None of them were interested in tennis, and they probably spent the whole day making the most of the free food and drink in the clubhouse, eating as if they were storing up beef wellingtons for the winter. Nadal’s match lasted the longest against Kendrick, stretching out to a long five sets before his Majorcan bottom fluttered off stage and the centre court prepared for Murray. “Time for tea!” said yellow teeth man, clearing a bit peckish having not hoovered up enough free grub. He left, dangling an empty bottle under his arm. I never saw him again. The light was fading by 7.30pm, and many people had sloped off after Nadal. From 5.30pm Centre Court tickets that have been returned can all be sold again – for £5 each, with all proceeds going to fund tennis facilities in underprivileged schools. Despite the fact that everyone knew Murray was on next, the place emptied out by about 60% and a new crowd of spectators came in. My Very Good Friend the Doctor was aghast at having to leave before Murray but she had tickets to go and do something, which she now very much regretted. I stayed and watched, having not moved since 12pm, powered by the bag of wilting bagels and cream cheese at my feet. Murray, then a slip of a boy, was at his first Wimbledon. I cannot remember who he played, only that his play was charismatic and one had the sense of the whole of Centre Court behind him. The game was inconclusive, as even he began staring up at the sky at about 8.40 and by 8.50pm they announced the end of what had been an awesome nine hours of live tennis. We started our sweltering journey back to the Cliff Richard buses, in a wave of wilting perms and flat lemonade bottles. I felt wonderfully lucky to have seen world class tennis, but strangely curious about the kind of greedy competition winner I met. Why would you enter to go to something you have no interest in going to? Because it’s free. Why on earth would you enter into a competition to play golf in Scotland, or watch tennis at Wimbledon, if you have no interest? Because it’s free. I wonder how the lady in the big hat’s career went as a full-time competition whore. I can only hope she is currently sunning herself on some exotic island, complaining at Alan for forgetting the sun lotion, drinking and having a thoroughly boring time on a holiday she didn’t want to take in the first place. It was, for them, truly magnificent to not have to pay for something. But it wasn’t magnificent for the rest of us to spend the day with them. Nothing on its own has any value, unless of course is it free. The freeloading justifies the means. They were those kind of people – if they had free tickets for the Olympics opening ceremony they’d have left in disgust if someone tried to charge them for chips. Wimbledon was my first and last lucky stroke. I may have had a fantastic opening match in the great game, set and match of competitions but since that day I haven’t wanted to enter into any others. This entry was posted in Uncategorized and tagged Getting Out Of Town, Murray, Nadal, tennis, Wimbledon. Bookmark the permalink.